Note that due to the sophisticated science of dental implants, it is important that you choose a dental implant expert like Dr. Nairi Kureghian and not just any dental practitioner. Would you be interested in replacing your missing teeth with the kind that don’t have to be removed? Dental Implants are a great way to replace missing teeth and also provide a fixed solution to having removable partial or complete dentures. Implants provide excellent support and stability for these dental appliances. 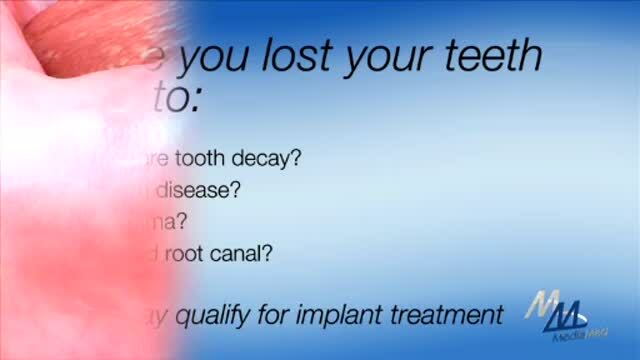 A dental implant is the best solution for a missing tooth(or teeth). Dentists all over the world recommend this procedure to patients because it is simple, virtually painless, and efficient. People who have lost single or multiple teeth generally are good candidates for dental implants. People who have lost all their teeth and rely on dentures for chewing and speaking. For these patients, implants used to support dentures (overdentures) brings an incredible improvement in chewing and speaking capabilities. It is very important that you are in good health as well as there are certain medical conditions and diseases that can affect the success of dental implants. For example, smoking, advanced gum disease (periodontitis) , diabetes,etc may affect the way implants integrate with your bone. It is important to have a thorough examination done with your health history reviewed with Dr Nairi Kureghian. All these factors will be examined in detail at your initial examination in the office. When a tooth is lost, the surrounding bone structure that housed the tooth begins to shrink. In general, there is a 25 % decrease in width of bone during the first year after tooth loss and decrease in height over the next few years. The bone needs teeth to provide stimulation to maintain its shape and density. Unfortunately when the tooth is extracted and the socket is empty there is no more stimulation. Because dental implants fuse to the bone and prevent further bone loss, they can preserve this process and stop the loss of bone. Traditionally, many dentists prepared a bridge to "fill in" the lost spaces when teeth were extracted. This involved cutting down and preparing teeth next to the empty spaces for crown preparation. A widely used and popular procedures it has the drawback in that sometimes healthy teeth may have to be cut down to make a bridge during this process. A great quality of dental implants is that NO adjacent teeth will have to be cut or reduced in anyway to restore the empty space in-between teeth. If you already wear dentures that slip and slide, Dr. Kureghian can use dental implants to anchor them so they stay put! Implant-supported dentures or overdentures provide tremendous support and are such a good fit. You can speak, chew, and smile comfortably, and even get rid of those messy adhesives! The procedure is easy and can often be completed in just ONE visit. And since Dr. Kureghian can SURGICALLY PLACE and RESTORE implants, there’s rarely a need to go anywhere else. Tooth implants (dental implants) are the best way to replace teeth because they feel and act like healthy, natural teeth. A tooth implant (dental implant) feels and acts like your original tooth (maybe even better) when implanted by Dr Nairi Kureghian.